Back in the 80s I was a summer camp counselor at the Los Angeles Zoo. We taught the kids all about the environment and how everything is connected. We taught them about all the odd animals that at the time people weren't super familiar with like meerkats and cassowaries. With all the zoo learning we also managed to throw in songs, fun and games. One of my favorite projects (since I never got to go to camp as a kid) was making friendship bracelets. So easy to make and quite addicting. I think I enjoyed making them more than the kids! 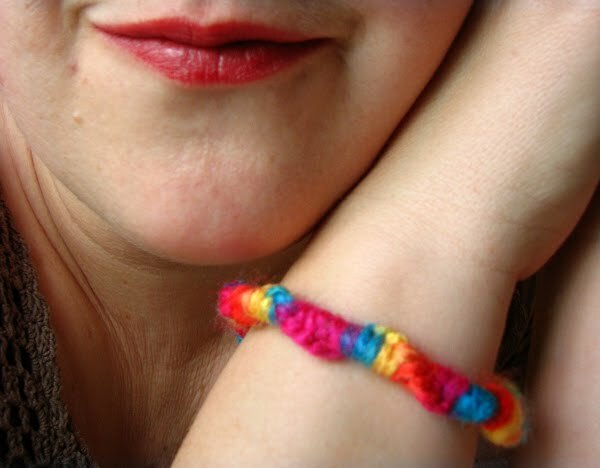 Since the 80s are back (again) and handicrafts are also back, let's make some friendship bracelets a la dilly-do! I've tweaked this tutorial only slightly so that smaller tots and can knot away. All you need is a good fat yarn! You will need three strands of yarn to make this simple bracelet. Two of the strands will be long enough to tie around your wee one's wrist with an inch or two extra to make tying easier. The third piece will be two and a half to three times longer. Cut your strings. Knot them together at one end and poke your safety pin through the knot. Attach the safety pin to your wee one's pant leg or the back of the sofa. Wherever it will be easier for your tot to work. 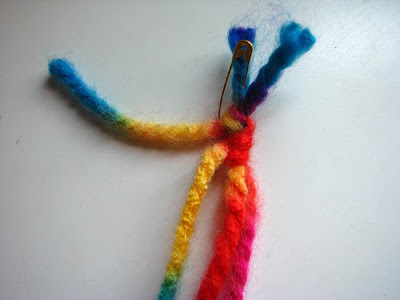 You will want to attach it to something stable as it makes it easier and aids in providing tension to that your kidlet can make the knots without too much trouble. 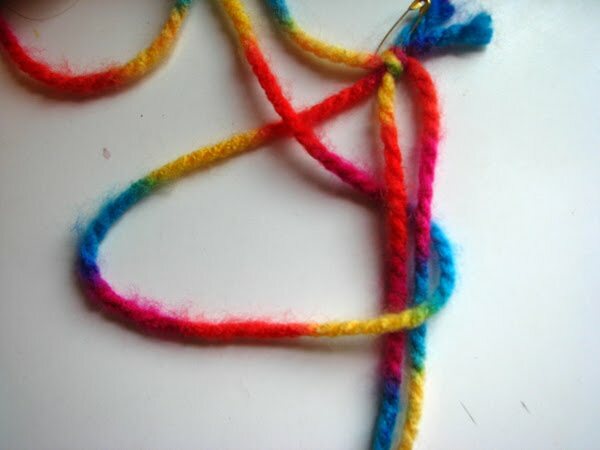 To make this friendship bracelet, you will need to learn is one knot and only one knot. It is really super easy once you get the hang of it, but kinda hard to show you without me being there but I'll try. To start, grasp the two strands of equal length in one hand and pull them taught towards your tot so that they are perpendicular to your tot's belly, like a line pointing up and down. The remaining strand of yarn (the long one) is going to be the single string you knot over and over again to create the bracelet. To begin, single the string at a diagonal away from the up and down string. You can angle it to either side, depending on how it feels in your tot's hands to wrap (right handed vs. left handed). From the diagonal line, about three or four inches out, bend the string so that it heads towards to other two. 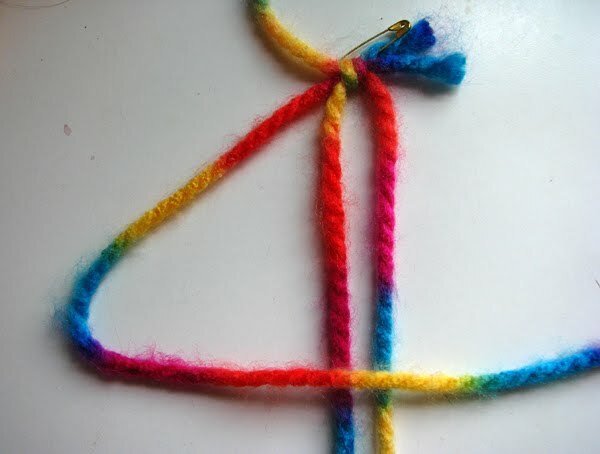 This will look like a pointed number four or backwards four if you're me. Next, push the tail of the long string (the one that crosses over the other two) UNDER the other two strands at a diagonal that almost crosses the first diagonal. Look at all the pictures I hope they help. If they don't, I made a video as well. 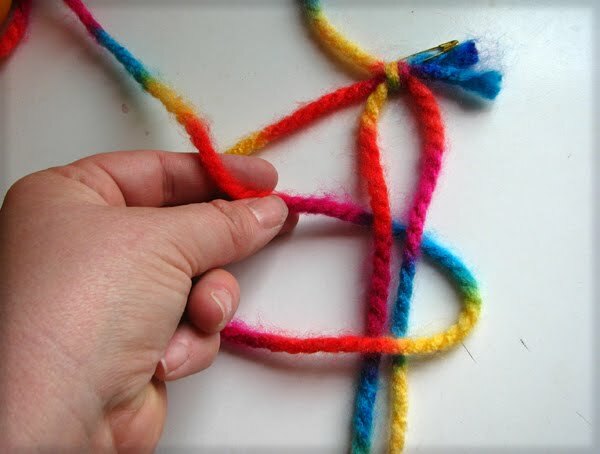 Now that you have the weird four shape and two strands of yarn pointing at your tot (or you) and one extra long string out, over then under the whole mess, you are ready for the knot. To make the knot, grasp thee two shorter strands in one hand and pull taut towards your body. With the ither hand, grasp the looped, longer thread and pull up away from your body. You will then have a little not somewhere up near the top of the whole shebang. Continue with the process...make the number four, weave over under and then pull. When you get the hang of it, your knots will form quickly and create a neat twisty pattern that spirals around the two base strands. When you have enough bracelet to go around the wrist, stop making knots and tie of the whole thing. 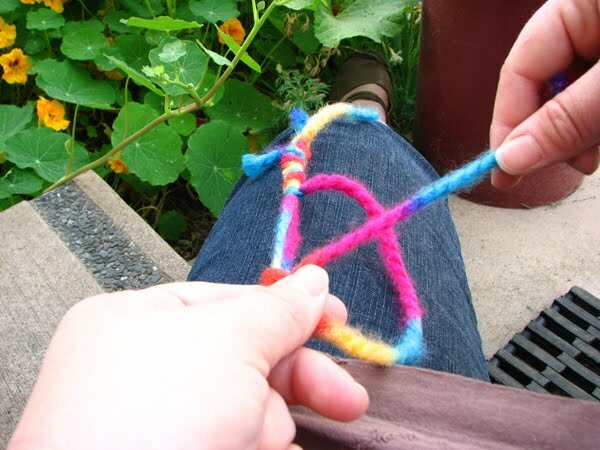 If you're feeling creative you can go for a loop top by looping the yarn into a noose-shape and then tying the other strands around it. If you want to go more traditional, you tie the bracelet onto your friend's wrist and hope it lasts forever! Happy kotting! Ooh I remember these! I love how it looks with the chunky yarn. This would be so much fun to do with kids. I'll be linking. I remember making these! 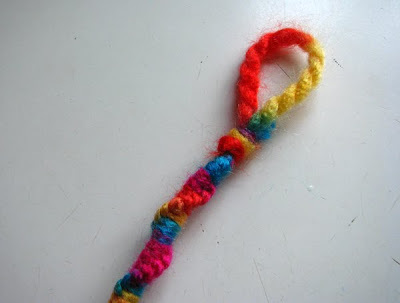 The chunky rainbow yarn is great. I remember making these as well as friendship pins! Love your chunky yarn version & the rainbow colors are fab! ooh..thanks. 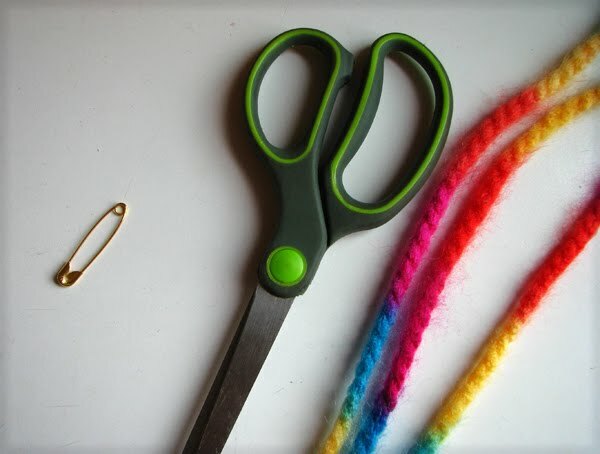 This is the same method used to make hair wraps - fyi!! I love these! I'm linking your post to my blog for a collection of great road trip activities. Should be up tomorrow! My daughters made these all the time when they were younger (10 or so), using two or three different colours of embroidery floss (all six strands). The chunky rainbow yarn, though not as shiny as embroidery thread, would give a bigger bracelet, and would probably be easier for younger children to work with. Awesome post..! Thanks for sharing this post. I am very interested in this topic.friendship braceletFriendship bracelets will vary from casual or capricious to elegant and complex. the choice appears to be endless!It may be that it is time to shower your friend or sweetheart with the gift of a bracelet that signifies your feeling for them.Carol D. writes articles and merchandise reviews on topics starting from relationship bracelets to hearth screens to clogs. Awesome post..! Thanks for sharing this post. I am very interested in this topic.string braceletClasp closure bracelets will feel restrictive when a couple of hours, yet as run the danger of snagging on one thing or somebody, consequently deterioration and changing into lost. currently in times that you simply have to be compelled to get the fashion right remembers to decorate your self however not an excessive amount of.